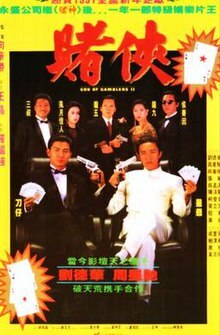 God of Gamblers II (Chinese: 賭俠; Cantonese Yale: Dou Hap; literally: 'Knight of Gambling') is a 1990 Hong Kong action comedy film written and directed by Wong Jing. It stars Andy Lau as Little Knife, Stephen Chow as the Saint of Gamblers, and Ng Man-Tat as Blackie Tat. This movie is a sequel to both God of Gamblers, which included Lau's character, and to All for the Winner, which starred Chow and Ng. This film should not be confused with God of Gamblers Returns, also released as God of Gamblers 2, and in essence the true sequel to the original God of Gamblers. Following the events of God of Gamblers and All for the Winner, In this movie, down on his luck, Sing (Stephen Chow), seeks out the God of Gamblers, in hopes of becoming his disciple. Unfortunately, the God of Gamblers is unreachable and out of the country, last heard to be in Brazil, and Michael Chan, the Knight of Gamblers (Andy Lau) replaces the God of Gamblers. When a phony attempts to impersonate the Knight of Gamblers in a huge scam, it's up to the real Knight and Saint of Gamblers to team up and defeat their formidable challenger. The film combines intricate action sequences with sharp comedic timing. Even though the international English title is God of Gamblers II, this is not the direct sequel to the 1989 film starring Chow Yun-fat. This film's title literally translates to The Knight of Gamblers, the name of Andy Lau's character. Wong Jing was so impressed with All for the Winner that he contacted Stephen Chow to star in two sequels made during 1991. This combo went on to make several money making films turning Stephen Chow into an Asian Comedy star and helping boost Wong Jing's status as one of the top film makers in Hong Kong. This movie is followed by God of Gamblers III: Back to Shanghai, which does not have Andy Lau, but features actress Gong Li in two roles.